Three garlic plants were left in the ground to mature to produce bulbils. The bulbs lose their protective skin if left in the ground. It is still excellent garlic but has short shelf life. They would make excellent seed garlic due to there full growth size.The mature Bulbils were protected from dispersal by covering with a gauze. When the cluster dries the seeds fall in a short time if not contained. There is a large number of bulbils in each scape cluster.Some of the bulbils will be planted to produce rounds in 2016. The purpose is to eventually to grow all the garlic from bulbils instead of using cloves from the current crop.Sequence takes three years, bulbils, rounds, few cloves, then full normal harvest. 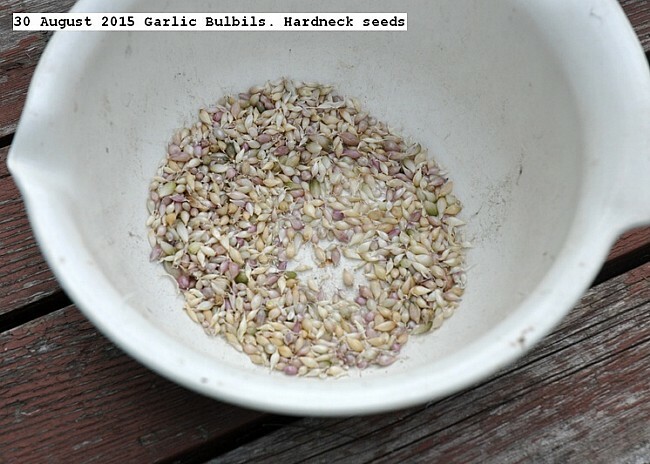 This entry was posted in Uncategorized and tagged 30 August 2015 Garlic Bulbil collection, bulbils, Garlic bulbils. Bookmark the permalink.